Heat oven to 375°F. Unroll dough; separate into 12 strips. Starting at center of ungreased cookie sheet, coil bacon slices with dough strips into a loose spiral, pinching ends together securely as strips are added. Look for precooked bacon slices in the deli section of the supermarket. 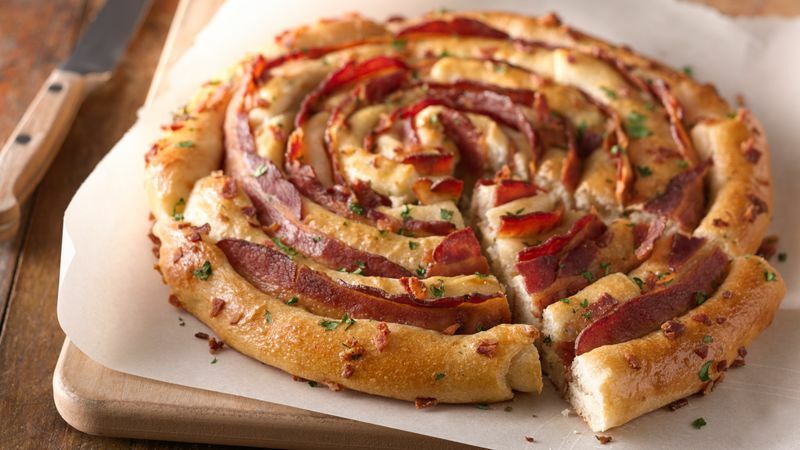 Pepperoni Breadstick Focaccia: Use pepperoni slices from half of a 3.5-oz package in place of the bacon. Cheese and Olive Focaccia: Pull 4 sticks of mozzarella string cheese apart into 16 strips. Use strips of cheese in place of bacon. Sprinkle 2 tablespoons sliced kalamata olives (instead of the chopped bacon) on top before baking.